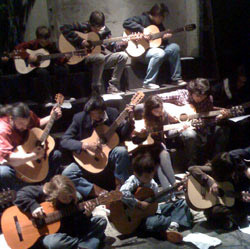 I have been teaching private guitar lessons since 1988, and since 2001 ukulele as well. I am formally trained in both performance and composition, and I teach students of all ages and levels. 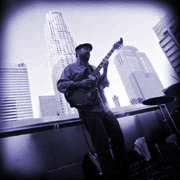 My stylistic skills include (but are not limited to) jazz, classical, rock, folk, blues, country, funk, and R&B. I've recorded for a variety of artists,TV, films and commercials, and have performed in a wide variety of idioms in the US and Japan. I perform locally on a regular basis as well. As an instructor, I focus on helping students to develop the skills they need in order to play what they aspire to play while simultaneously building good technique and basic music fundamentals. I tailor my teaching to each student's individual needs, depending on his or her goals and abilities. I strive to create a comfortable yet rigorous learning environment. For me, it is richly rewarding when a new concept or technique clicks into place for a student and he or she experiences the thrill of achieving a new level of ability. Whether you are a total beginner, a singer/songwriter who wants to take your playing to a new level, or a career musician who wants to widen the scope of your abilities, I can help you achieve a higher level of playing and musicianship. 1. New students may pay by the lesson for the first month. After that, monthly payments are made at the beginning of the month. Acceptable forms of payment are cash, checks, and PayPal. Receipts available upon request. 2. At least 24 hours notice is needed for cancellations in order to receive credit. Limit one credit per month. No credits given for same day cancellations or no shows. If possible, I will reschedule you, but it is based on availability. 3. At this time, the rate for lessons is $30 per half hour, $60 per hour. Students have a standing weekly appointment. It is not possible to do bi-weekly lessons. 4. For those students who have schedules that do not allow for a standing weekly appointment, they may schedule "one-time-only" lessons at their discretion. Naturally, these are paid for one at a time. 5. 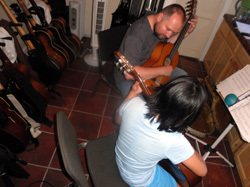 All lessons take place at my lesson studio in Atwater Village. The only available house calls are open ended lessons that are $160 each, and must be within a thirty mile radius from my studio. Gift certificates are available as well. I welcome inquiries. Please text, email or call me for any further details.